Top-10 most productive countries: are they the wealthiest, the most efficient and the happiest? We are wondering whether soon-to-be-updated statistics from the Organisation for Economic Co-operation and Development (OECD) would spring any surprises this year. In the meanwhile, we decided to revisit previous rankings of the world’s most productive countries and explore global productivity landscape. 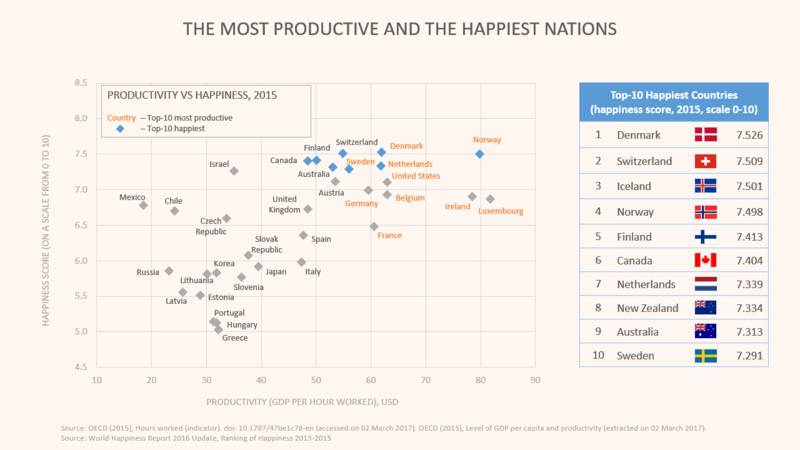 Which nations are the most productive, are they the richest, the most efficient and the happiest? Race for productivity started at the time of the Industrial Revolution and only accelerated since. Labour productivity is what drives economic growth. Measured as GDP (output) divided by hours worked per person (input), productivity is often used as an indicator of a country’s economic health. 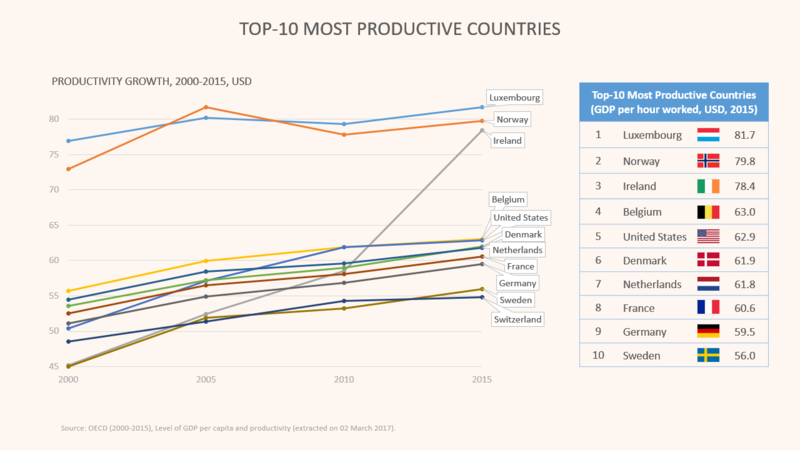 Luxembourg and Norway keep their leading positions over the years and leave other economies far behind (81.7 USD and 79.8 USD hourly productivity correspondingly) . 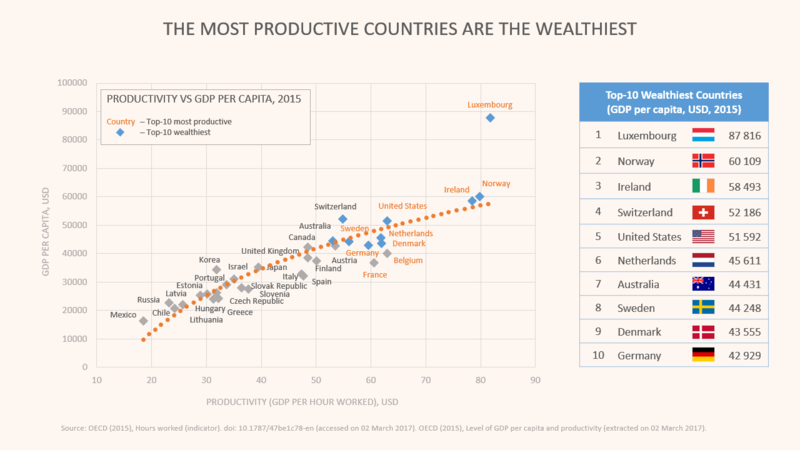 Ireland managed to take the third place, improving hourly productivity from 45 USD (in 2000) to 78.4 USD (in 2015). An extraordinary leap forward is due to the decease of corporate taxes, which attracted foreign investments into the country. United States – the only non-European country in the Top-10 – has moved from the 8th to the 5th place with 62.9 USD hourly productivity in 2015, showing fast growth rates. 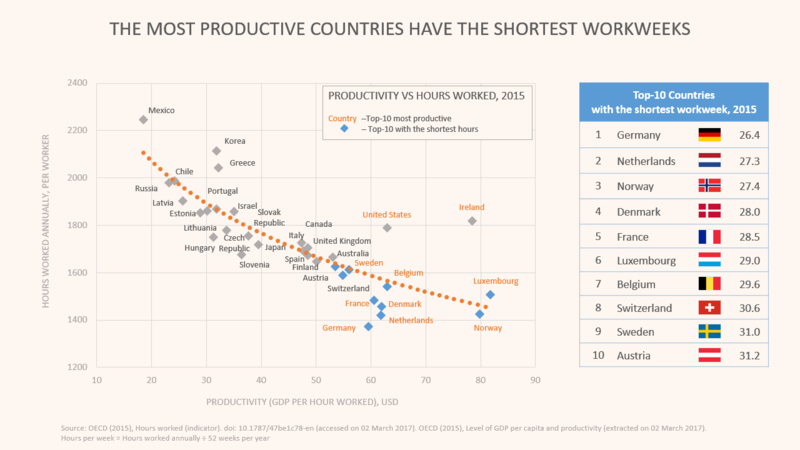 Germany ranks #9 with 59.5 USD hourly productivity, supporting its reputation for efficiency. Sweden has also worked its way up to 56 USD hourly productivity and pushed Switzerland to 11th position in the ranking. Not far behind from the Top-10 are Switzerland, Austria, Australia, Finland, Canada, United Kingdom and Spain. However, it is a tight competition for a place in Top 10 requires not only to outperform other countries, but also to surpass own records. Productivity is about constant improvement – standing still means falling behind. Worth mentioning that average growth rates among the Top-10 are gradually slowing down though. Emerging economies on the other hand, Eastern Europe or Latin America for example, show faster growth due to higher potential for productivity improvement. However, any drastic changes in the global productivity landscape in the next few years are rather unlikely. Luxemburg keeps the leading #1 position by gross domestic product per capita and remains unmatched. Not only it is the most productive country in the world, it is also the wealthiest nation with nearly 88k USD GDP per capita. Norway is #2 with about 60k USD per person, closely followed by Ireland. Switzerland and the United States – note the 40-fold (!) difference in population size – have about the same level of GDP per capita at 52k USD. At the same time, USA is on average more productive. To calculate how much time a week an average employee spends at work, we divided hours worked per person annually (by OECD statistics) by 52 weeks a year. Although there is some correlation between productivity and hours worked, there are also significant differences in the length of workweek. 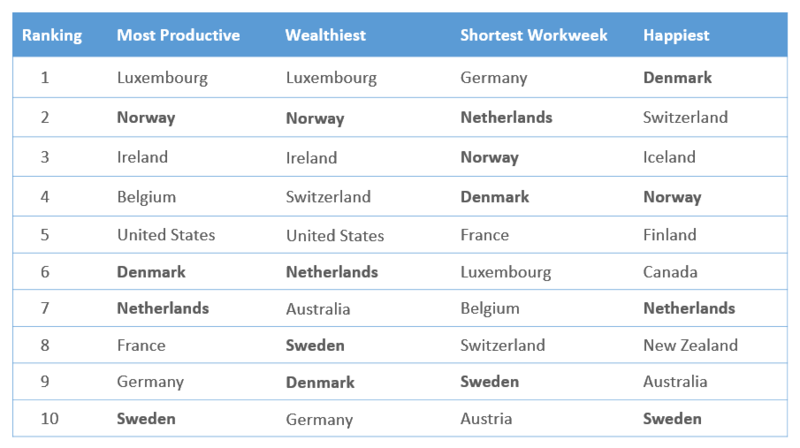 Average workweeks in all of the Top-10 most productive countries are less than the typical 40 hours. Employees in Germany work the shortest hours – 26.4 hours per week on average. Yet Germany is one of the most productive countries in the world. One more statistical proof that German efficiency is not a mere stereotype. United States has about the same productivity level as Belgium or Denmark, but American employees work roughly 5-6 hours a week longer. Similar situation when comparing Ireland against Luxemburg or Norway. They all have comparable productivity, but the Irish work 7-8 hours longer. On a side note, the latest initiatives in France and experiments in Sweden to cut down working hours may change the positioning of players in the next few years. Indeed, working longer hours isn’t the best strategy to achieve higher productivity. However, shorter hours do not guarantee high productivity either. There is another factor here – efficiency. Only efficient use of time and resources allows you to get more done in less time. Productivity is about efficiency and working smarter, not longer. It feels lately that the term “productivity” is getting negative associations with stress, burnout, and constant pressure to deliver more-better-faster. So we decided to match productivity indicators from OECD statistics against happiness levels in these countries from the UN’s World Happiness Report. Happiness score takes into account GDP per capita, social support, healthy life expectancy, freedom to make life choices, generosity, and perceptions of corruption. Denmark ranks #1 happiest nation in the world. It is closely followed by Switzerland, Iceland and Norway. Finland, Canada, New Zealand and Australia are also in the Top-10 happiest nations. Mexico and Chile are at the bottom of OECD rankings – low productivity, small GDP per capita and very long working hours. Nevertheless, people in Mexico and Chile are not a less happy than citizens of Luxemburg, which tops most rankings – except this one. Being productive does not make you happy or unhappy. In fact, productivity, efficiency and wealth do not always go alongside either. But some countries manage to combine it all! Netherlands, Denmark, Norway and Sweden are the only countries that rank in all of our Top-10 lists: productive, wealthy, efficient and happy. How do they do it? What does productivity mean to you? Please share your thoughts in the comments below.